Greenwood Lake firefighters battled a house fire Sunday, February 20th at 16 Chestnut Street. The residents of the home discovered the fire just after noon and barely escaped the fast moving flames. Two of the occupants were injured in the fire and were transported to the hospital by the Greenwood Lake Ambulance Corps. One was treated for minor burns and the other for smoke inhalation. The family’s two dogs and a pet snake died in the fire. Firefighters from Warwick, Chester and Tuxedo assisted Greenwood Lake at the scene of the fire. Crews from the Monroe and Greenwood Forest Fire Departments were placed on stand by in Greenwood Lake’s firehouse during the incident. According to Greenwood Lake Fire Chief John Rader the cause of the fire is not considered suspicious. 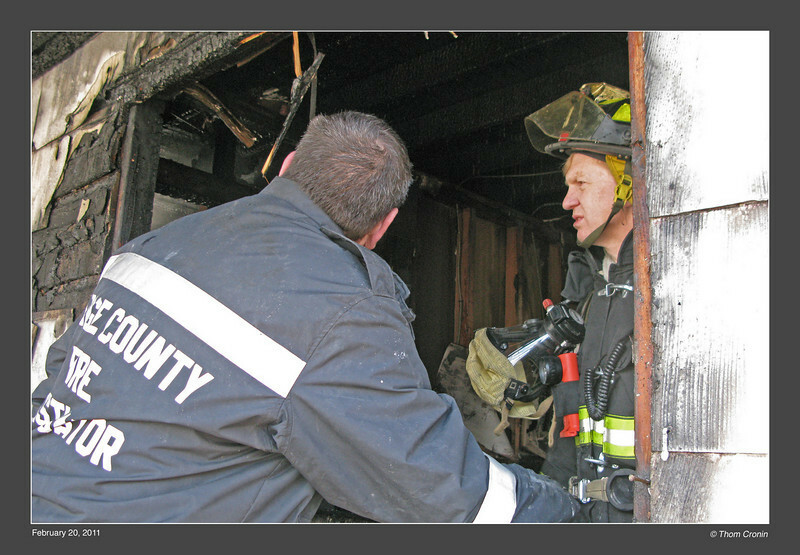 Orange County Fire Investigator George Haas searches for the cause of the fire.